Pete Anderson is better known in the country music and roots-rock business from his long association with artists list Dwight Yoakam, Roy Orbison, Lucinda Wiliams, and others. But he's gaining a solid reputation in the blues world, as heard previously on his 2010 album, Even Things Up (read review here). His newest, Birds Above Guitarland (Little Dog Records), reinforces Anderson's versatility and love of the blues genre. Anderson plays all of the guitar parts as well as adding bass on most cuts. Many of the same backing musicians return, led by keyboard player Michael Murphy, to create one of the stronger blues discs of the year. Birds Above Guitarland kicks off with a nice shuffle, "Outta' The Fire," that showcases a strong horn section featuring Lee Thornberg on trumpet and Ron Dzibula on sax. The upbeat, soulful "36 Hour Day," with good keyboard accompaniment, follows; it's one of the best cuts here. We can identify with Anderson here in that we all need more time every day to appreciate and take care of those we love the most. "Talkin' My Baby Down" is a bluesy shuffle that would also go over well in any country dance hall, with Anderson making his instrument sound almost like a steel guitar along with Murphy's honky tonk piano. One of his guitar solos here even made me think of the late guitar legend Danny Gatton, an ultimate compliment to any player out there. "Empty Everything" has a bit of a Cajun sound thanks to Dennis Gurwell's tasteful accordion playing, but Anderson's guitar work keeps it strongly on the blues side. James Cruce's dirty drumming with brushes adds a nice backline. Anderson slows it down with the late night blues of "I Got Mine," with the horn section taking it uptown to provide a nice contrast to his tasteful jazzy guitar work. The absolute highlight of Birds Above Guitarland comes late in the lineup, with two excellent versions of a snaky, mid-tempo blues, "Rock In My Shoe," both of which feature Anderson's surprisingly good chromatic harmonica playing. Great lyrics here --- "... put a rock in my shoe, try to get back with you, I put a rock in my shoe, got a lot of walking, got a lot of walking to do ..." Anderson handles the vocals on version one of this number, but the real treat is when special guest Bekka Bramlett arrives to do the singing on version two. Nested between the two versions of "Rock In My Shoe" is a killer instrumental number, "Red Sunset Blues," which could easily be used as the theme music for a Quentin Tarantino-style western. Murphy really gets to stretch out with a lot of special effects from his Wurlitzer as well as playing some very nice piano. But what really puts the icing on this cake is Thornberg's french horn playing. 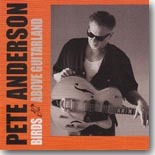 Pete Anderson has another winner with Birds Above Guitarland. Just like his previous CD, it gets better the more times you listen to it.